Truman’s, in Brick Lane, in the 1960’s brewed a cask ale (LK) which was London Keeper. 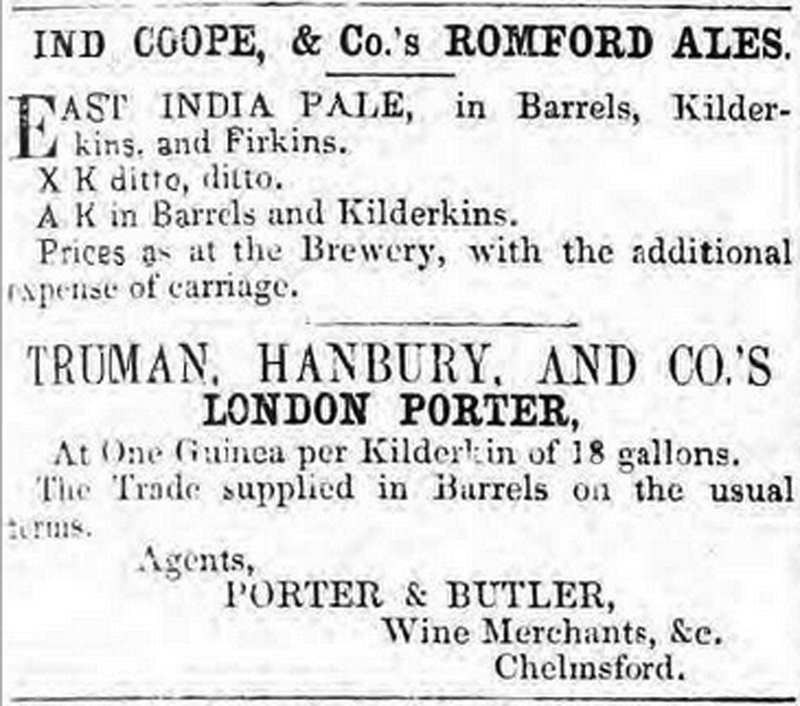 The bottled light ale (Trumans light) was brewed as BLK or bottled London Keeper. Both were brewed at OG 1030.9 and lightly primed post fermentation. Thank you, Peter … that woukld certainly back up Ron’s belief. That will be the descendent of XLK which was brewed before WW I.
Martyn, complete and thoughtful as always. The single koyt explanation is still useful, not as a theory, but as useful conjecture. Conjecture has its place when trying to reconstruct events of so long ago especially if no other good explanation exists. It simply may be true that a bitter beer, not aged, was called that informally for a long time and the name finally emerged in commerce, leading to confusion today when bracketed with the KK beers and other keeping ales which had their origin in the ale tradition (vs. beer). However, I think A.K. did meaning ale for keeping because, first, a contemporary brewer said that (I have noted it before) and it can’t be dismissed as “a guess” because it attested to a contemporary understanding. Second, a number of late 1800’s writers, going from memory here but including Graham and Moritz I believe, explained that some bitter beers received longer storage than mild ales but less than the export pale ale or best quality pale ale. This is why the “k” in AK can still mean keeping, a keeping for longer than the mild running ales. Even if you kept them 2 weeks longer before sending out, it is still a keeping in relative terms. In this court case, which I know you are aware of, the meaning of IPA and AK was considered because important to the result. The brewer here stated plainly that A.K. was a bitter beer, classed with IPA except sold in a different channel normally and clearly the less expensive version. 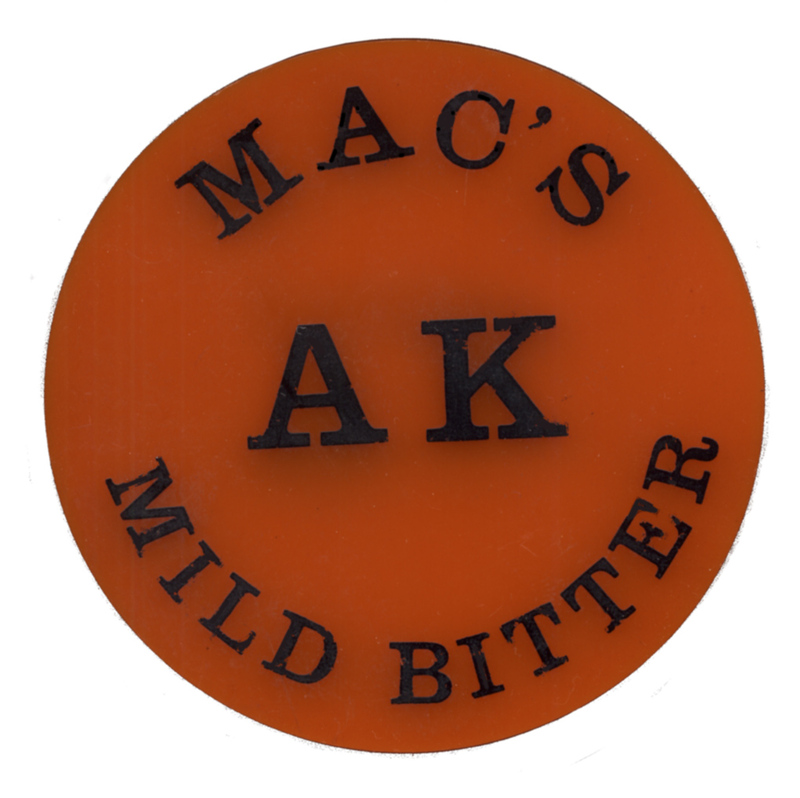 I’d wager that AK was stored longer than the typical mild ale of the time. Why don’t you unearth the court record, it should still be available somewhere, I’d think the solicitors might have submitted written arguments which survived which discuss the further meaning of “AK”. I am not certain where the records would be, perhaps one of your readers who is an English solicitor, or has a spouse or close friend who is, might suggest how to unearth that record. A is an indication of strength: 1 down from X.
I’m pretty sure the K does stand for Keeping. It’s often found in Bitter designations, even though many of them weren’t really stored long. My gut instinct (which is worth exactly 0…) is that you’re right: beers brewed for keeping were heavily hopped, and thus more bitter; so, over time, K just came to mean light and/or bitter, regardless of whether the beer in question had been kept or not. As for the mild k’s, there was also a mild bitter (at least one) that has been uncovered… My feeling is with the shading of the AK’s and dinner beers (gem beers, etc. – all lighter pale ales) into the unstored category, the meanings got confused, and that is why for a long time McMullen called its AK a mild. Could it be that the K was in some way the the P (or the I for that matter) in IPA seems to have become? 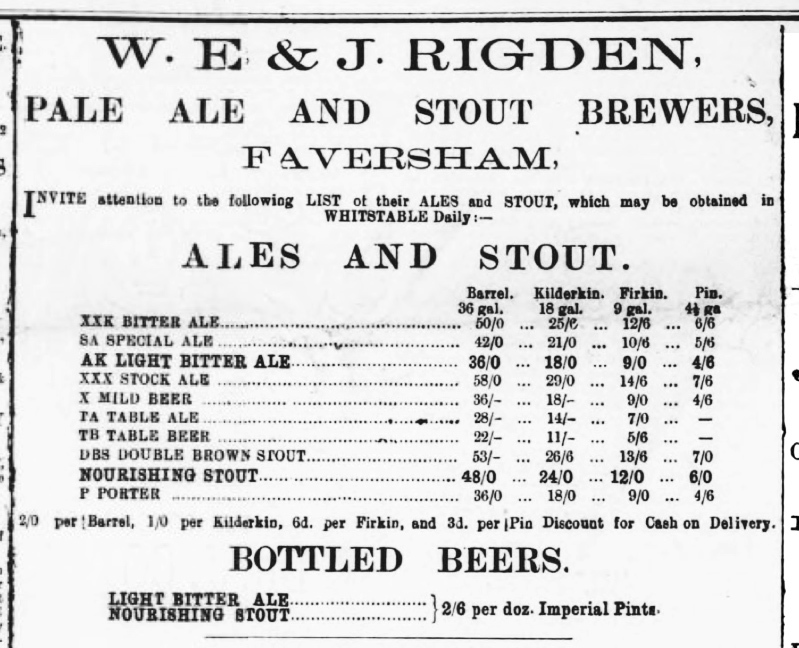 Incidentally, great find of table ale and table beer in the Rigden ad (1893), surely the latest date both of these – or even one of them – appeared in a public advertisement. I would be surprised if the Hardy’s&Hanson’s KK doesn’t simply represent “Kimberley Keg” as the brewery was known as the Kimberley Brewery , that being its location. My Dad told me years ago that it was short for Kimberley Keg and was essentially H&H’s Kimberley best bitter delivered via keg rather than cask. It tended to be found in clubs rather than pubs and was delivered in some places by an electric pressure system that showed the next pint or half in a glass cylinder on the bar. It would seem strange that the ‘K’ would have a different meaning in AK than in the other K beers, and I suppose ‘keeping ‘ is relative. Two weeks or two years, if the beer was kept any longer than another then it might warrant the use of ‘K’. I would have thought the obvious answer would be that AK stood for Ale Keeper. For information, the beers Truman’s brewed in the 1960’s (in London) were SA (Strong ale); KLPA (Keg London pale ale; LPA (London Pale Ale) ; LELA(London Export Light Ale cans); LK(London Keeper; BLK(Best/bottled London Keeper-bottled as light ale); Ale(no abbreviation); OW(Old Writtle; BA(Brown Ale); LM(London Mild); ES(Eagle Stout); MS(Malt Stout); S1(Stock Ale); R1(Runner 1): R2(Runner 2). From Burton add PA1 and PA2 (Burton bitters) and P1B(Ben Truman). As you can see there is no brain surgery needed to decipher most of them. But English doesn’t put the adjective after the noun – and AK is took weak and lowly-hopped to be a keeeper. So no – it’s not obvious at all. But both are nounss. And the K usually goes at the end in these designations. Surely in this context either one could be an adjective! Though the B in P1B stands for bottling, not Ben Truman. Or does it stand for Burton?? None of the other Burton-brewed beers have that suffix. In 1877 there were 5 different versions of P1: P1, P1 B, P1 K, P1 R and P1 S. R will be Runner, K Keeper, S Stock and B Bottling. Look in the paragraph entitled Bitter Ale (p. 234), the second one, by the anonymous “Aroma”. He said it meant “keeping ale”. 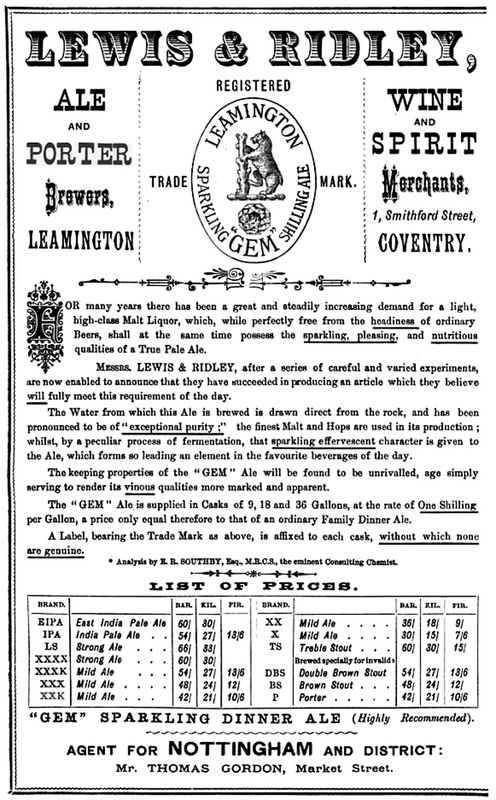 His description of bitter ale manufacture is very detailed and shows his deep experience in English brewing. It isn’t incontrovertible “proof”, but it is good evidence of the contemporary understanding. McMullens state on their website that the ‘K’ was equal to half an ‘X’ and referred to strength which is why AK beers are relatively low in alcohol. They claim the ‘K’ was used as it looks like half an ‘X’. I wonder if they have any historical documents to confirm this assertion? 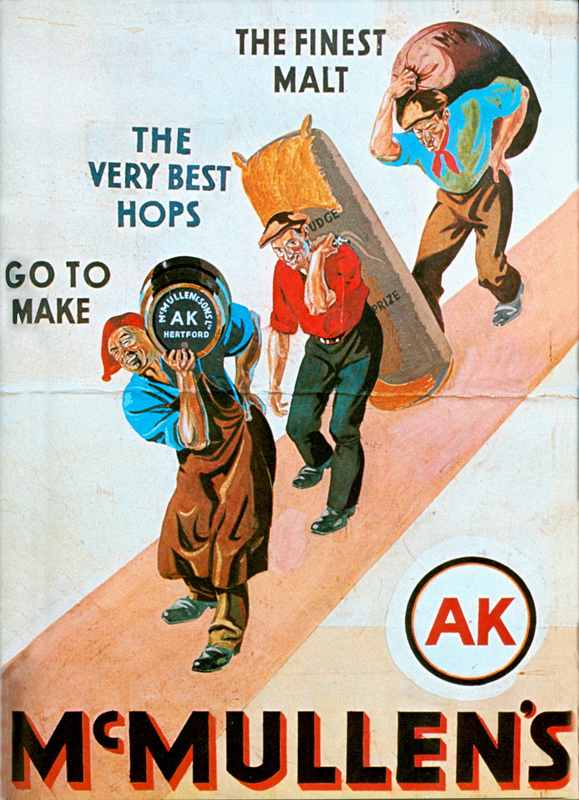 If that’s true, how come you get beers called AKK? Wouldn’t that be AX? Staying on the subject of beer designations, but moving from K to B, can I ask Martyn, as the acknowledged expert on Flowers/Greens, about the Luton-brewed beer known as BB? This was brewed under the Flowers label in the 1960s (and it may well originally have been a J W Green brew), and was still being brewed as a keg beer under Whitbread in the new Luton brewery at least until around 1980, when I had to visit the brewery for a meeting. I recall that the brewing staff told me that BB was a light mild, but they either didn’t know what BB stood for, or I didn’t ask. 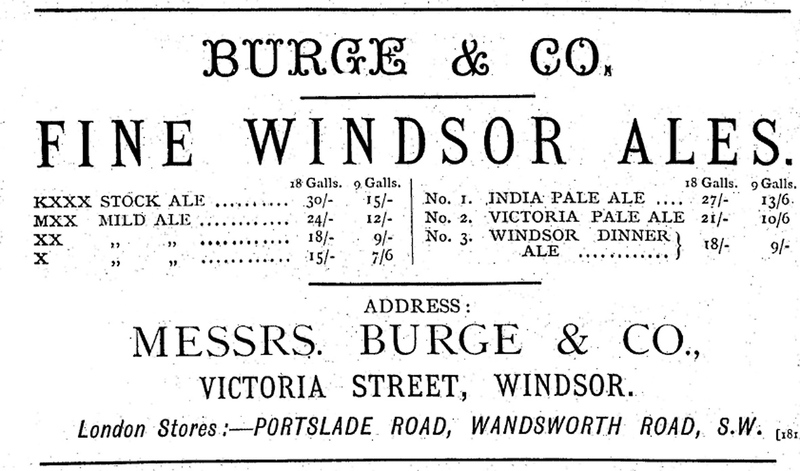 I suspect that this may have been the beer referred to by Frank Baillie as “Best Bitter – London area only” in his “Beerdrinker’s Companion”, as I never came across any beer called Whitbread Best Bitter at that time. If it was the same beer, it seems implausible that BB stood for Best Bitter, and Baillie may just have made that assumption. It would also be interesting to know when Flowers Keg was finally discontinued: did it survive the closure of the original Park Street West brewery? I suspect it may have done, as references to it appeared in various pub guides until the very early 1970s, but I am pretty sure it had disappeared completely by 1972, when I began to take an interest in beer. I believe the last beer to be labelled as Flowers (until the name was revived in 1981) was Flowers Special Bitter, which seemed to take the place of Trophy Bitter in the Whitbread Flowers (Cheltenham) trading area. I never saw it served by handpump, and it may have been a keg only (as opposed to top-pressure) beer. However, it disappeared in the first half of 1973 and was replaced by Trophy Bitter (though it may well have been the same beer, in keeping with Whitbread’s policy of calling a multiplicity of local beers Trophy Bitter). Pingback: We're Stumped - Help! Hi Martyn. Thanks as always for your honest and painstaking historical analysis. Researching 1940s pubs, by chance I came across a stock photo taken in the Admiral Napier, Ramsgate, in October 1945. A sign on the wall says “Try our KK Best Bitter”. The story of the photo is also rather fascinating. The photo can be viewed at: http://www.alamy.com/ by entering photo no. B5B0TX.